Siliguri: The sixth Kanchenjungha Winter Tourism Festival 2017 will be held at Pelling in West Sikkim from December 25. The seven-day fest will be organised by Pelling Tourism Development Association to promote winter tourism in the Himalayan state. "Tourists should not confine themselves to a few months of the year. They should visit and enjoy the resplendence of Sikkim throughout the year and even in winter. To encourage tourist inflow, we have planned the fest," Sushil Tamang, a representative of the association, said on Friday. Also, he said, they intend to expand the scope of tourism industry in Sikkim, encourage conservation of biodiversity, showcase organic farming and provide economic benefit to local residents through tourism activities. The organisers also mentioned that because of the 104-day long agitation and strike in the Darjeeling hills, the tourism sector in Sikkim. Now that normalcy has been restored, they want more tourists to pour in and enjoy the chill, which eventually, can help them in compensating their losses due to the reduction in turnout of tourists during the past few months. "During the fest, tourists will have the facility to enjoy several added attractions," Tamang said. In course of the fest, there will be exhibition of photographs, ethnic food and beverages available at stalls, organic food selling counters, flower show, fashion show of traditional attires and cultural functions. "A tourist can enjoy adventure sports like paragliding and trekking. They can join in fun sports and short distance marathon, along with sightseeing, which usually is there in the itinerary," said Tamang. Some other organisations associated with tourism have joined hands with PTDA to make the fest successful. Among these include the Eastern Himalaya Travel & Tour Operators' Association, Sikkim Hotel and Restaurant Association, Sikkim United Tourism Organisation, Travel Agents Association of Sikkim and Sikkim Association of Adventure Tour Operators. "The third edition of Bengal Travel Mart will be held on February next year in Siliguri. 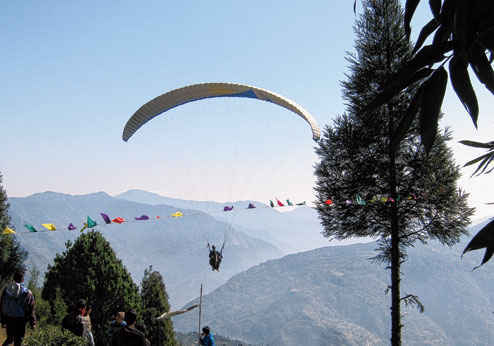 Ahead of the mart, such festivals in Sikkim would surely encourage tourism in the region that had got affected due to the disturbances in hills," said Debasish Moitra, president, EHTTOA.